Yesterday Apple Inc has unveiled a new Operating system iOS 7 to its iPhone ,iTouch and iPad devices. 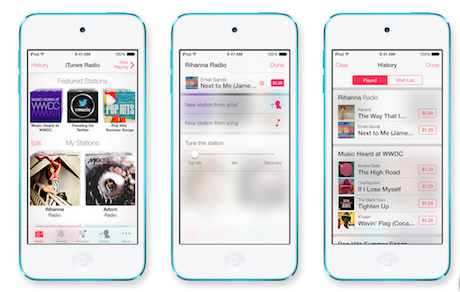 Many feel that Apple has lost its richness in display with its new iOS7. People even commented that "Apple hired 10 year old boy to design the icons". Funny isn't ? New system design with more simplicity. Supports multiple apps to run at once. Swipe up and Swipe down across the display screen are implemented. Calender has been cleaned but and looks more streamlined. Feature to organise your photos. Siri voice is made more human than robotic. To deter theft, iPhone with a new Activation Lock turned on will need your Apple ID and password to reset and reactive. For more highlights watch this video. Will iOS7 a killer of Android OS ? I don't think so. After going through all these features, do you feel that Apple has copied many features from Android ? iOS7 will be downloaded to your iPhone4 and later, the iPad2 and later and the iPad Mini for FREE. Test version is available to developers recently.Official version will be available this fall. So lets wait..